What kind of e-bike suits you? Our e-trekking bikes are truly versatile: they are ideally suited for a quick exercise session, extensive holiday tours or even for everyday tasks. All the while making you fall in love at first sight. Ambitious design meets exhilarating riding dynamics. Kalkhoff’s Endeavour 5 e-trekking bikes will captivate you with their integrated batteries, clean cockpits and Kalkhoff’s idiosyncratic design. The innovative platform concept also offers an extremely wide range to choose from. Kalkhoff Endeavour 3 offers an introduction into the world of integrated e-bike design. 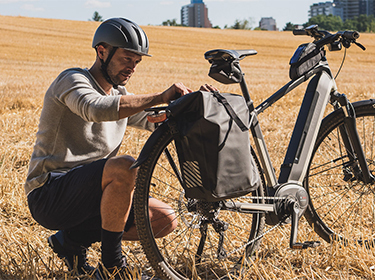 Honed over time: Kalkhoff’s Endeavour 1 models equipped with external batteries are universal e-trekking bikes suited to everyday life as well as cycling for pleasure. Adventures begin as soon as you leave your front door thanks to Kalkhoff’s Entice e-bikes. Whether cycling on tarmac or in nature - the Entice models will confidently overcome whatever terrain you throw at them. Our city e-bikes are multitalented. Perfect ergonomics, simple handling and perfect riding comfort - for short stretches and long outings. Image 5 is the crowning achievement of the e-city segment. The Image 5 models are elegant and combine optimal integration with high-quality convenient equipment and an upright sitting position. There’s comfort, and then there’s Agattu 3: comfort takes top billing for the Agattu 3 family. The particularly low and wide step-through points the way: simple handling and optimal riding and operating comfort are the Agattu 3’s outstanding features. They have been bestsellers for years: a low step-through, high riding stability and energy reserves even for long outings are the reasons behind the Agattu 1 models’ popularity. Our urban e-bikes are lightweight, robust, uncomplicated and, with good reason, among the most popular e-models in cities, thanks to well thought-out features. Kalkhoff’s Berleen 5 models are real eye-catchers and hardly look like e-bikes from a distance. The puristic concept is the ideal type for a modern, urban e-bike: lightweight, manoeuvrable and stylish. The e-bike with small wheels but big talent is a master of transformation: it is suitable for riders of all sizes and can fit into the tightest storage spaces. It also offers a great ride.